Do you need a solution to grow loyal clients and boost your revenue? Implementing Loyalty program is the answer to a successful campaign to build your brand and have your clients coming back to your venue. With the growth of mobile phone usage, SMS loyalty programs have become one of the most successful and easy to implement marketing channels. Your clients will simply need to text in a keyword to join your loyalty program, and start receiving rewards immediately after that. Upon joining the program, your employees will be able to check-in all customers, by just asking for their phone numbers. 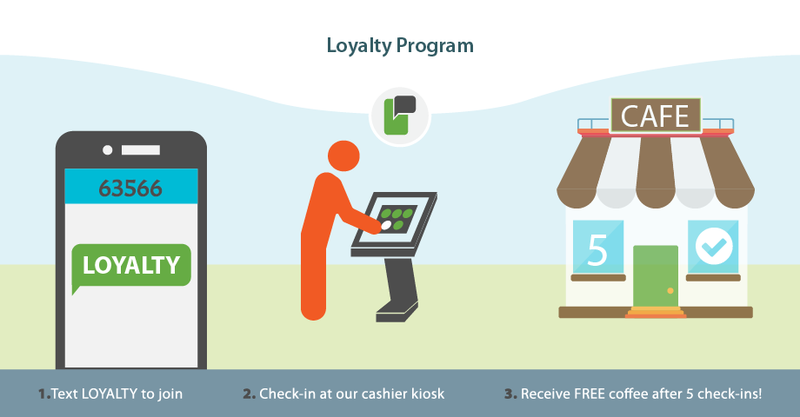 After your loyal clients collect enough check-ins, they will be able to get rewards – FREE coffee, pizza, tickets, etc. Easy, quick and flexible set up. Promote your SMS keyword, and start building loyal clients. Increase repeat customers and boost your revenue. Real-time reporting and amazing support!